The hotel was renovated in 2012. The hotel features 405 accommodation units. Guests of the hotel are welcomed in the lobby, which has a 24-hour reception and a 24-hour check-out service. Amenities include a safe and currency exchange facilities. Internet access and wireless internet access (for a fee) are available in the public areas. Gastronomic options offered by the hotel include a restaurant, a café and a bar. Guests can visit the supermarket to purchase daily necessities. Shopping facilities are available. Parking facilities available to guests include a garage (for a fee) and a car park (for a fee). Among the additional services available are room service, a laundry and a hairdressing salon. A conference area with a conference room and a business centre is available. All rooms feature air conditioning, central heating and a bathroom. Among the amenities are a safe and a minibar. A fridge and tea and coffee making equipment contribute to a comfortable stay. An ironing set is also available to guests. Each accommodation unit offers internet access, a telephone, a TV and a radio. Each of the bathrooms features a shower and a hairdryer. 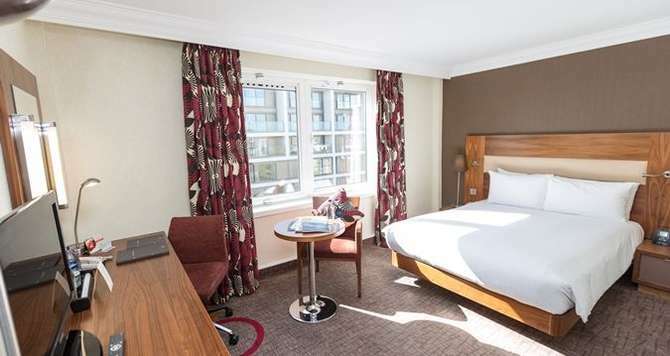 This modern hotel is situated on bustling and fashionable Kensington High Street, a 5-minute walk from Olympia Exhibition Centre. Numerous shops, restaurants, bars and pubs are within easy reach. Links to public transport can be found in the immediate vicinity of the hotel. Leisure options at the hotel also include tennis, golf, a gym, a spa and massage treatments. A spa area with a solarium is available. Further available options include a kids' club.